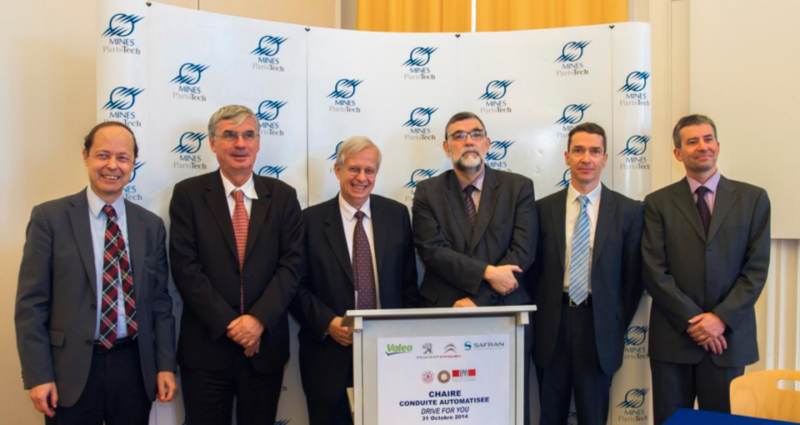 From left to right : Benoit Legait, President of Fondation MINES ParisTech – Jean-Paul Herteman, Chairman & CEO of Safran – Jacques Aschenbroich, Valeo’s Chief Executive Officer – Gilles Le Borgne, Director of Research and Development PSA Peugeot Citroën – Romain Soubeyran, head of MINES ParisTech – Arnaud de La Fortelle, Director of MINES ParisTech’s Center for Robotics and holder of the new chair. “The automated driving chair is a logical extension of the work we have been doing for more than 20 years in collaboration with key industry players on such topics as smart vehicles, control, virtual reality, artificial intelligence, mobile robotics and logistics,” said Arnaud de La Fortelle, Director of MINES ParisTech’s Center for Robotics and holder of the new chair. “The creation of this chair demonstrates the confidence our industrial and academic partners have in us and sends a strong signal worldwide about the excellent research carried out in the automotive sector by MINES ParisTech and our Robotics Centre,” commented Romain Soubeyran, head of MINES ParisTech. “The new chair is perfectly aligned with Valeo’s innovation strategy because intuitive driving is one of our key focuses. This alliance between leading manufacturers and world-class academic institutions will speed up the development of connected, autonomous driving solutions,” said Jacques Aschenbroich, Valeo’s Chief Executive Officer. “This partnership between PSA Peugeot Citroen, MINES ParisTech, Valeo and Safran will provide exceptional conditions for research to grow up knowledge of automated driving on a global level. Supporting this chair is a way for PSA Peugeot Citroën to reaffirm its ambition to develop autonomous vehicles in line with the practices in the future,” said Gilles Le Borgne, Director of Research and Development PSA Peugeot Citroën. “Safran believes in the cross-fertilization opportunities of aerospace and automotive technologies. Automated systems of land vehicles of the future and the flight of unmanned aircraft in civilian areas share common issues and will benefit from an accelerated development with the work of this chair,” said Jean-Paul Herteman, Chairman & CEO of Safran.